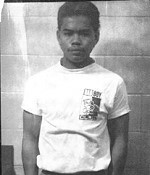 The 1991 unsolved homicide of Jerry Riley. Skeletal remains were found on October 24, 1993 in a remote wooded area off Kettle Rock Road in Epsom, NH. The remains were later identified as Jerry Riley, age 25, of Manchester, NH. An autopsy revealed that he died from a gunshot wound to the head most likely two or three months before the remains were found. The medical examiner concluded that the manner of Jerry's death was a homicide.